What Are They Used For and How Do They Work? Our Reiki/Energy Boards may be used as an aid for distance healing, affirmations, to positively energise a situation or project, or to help create a personal sense of balance and well-being. They are a super working tool, handcrafted by healers and once cleansed and programmed, they stay charged with positive healing energy for days. By setting crystals in a geometric pattern, as shown on the board, it amplifies the energy to a greater level than that of the actual number of crystals - making them an extremely effective way of focusing and directing energy. Their unique design incorporates elements of Sacred Geometry and the Platonic Solids, Five Element Theory, Crystal and Colour Healing. Why Are They Called ‘Reiki / Energy Boards’ and Can Anyone Use Them? The original founder of Patinkas was a Reiki Master, Sensai and crystal healer. 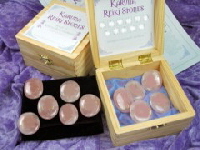 She initially developed these boards for use in her personal healing work; utilising the energy of Reiki to charge and cleanse the crystals and to direct healing, but as with all types of healing or ‘energy’ work, she recognised that the intent and integrity of a request was paramount. Therefore, you do not need to have undergone any kind of formal training, attunement, or initiation to be able to use one - pure intent and a desire to work with the wonderful energy of crystals is all that is required; hence, ‘Reiki / Energy Boards’. 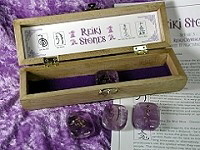 They come complete with a Clear Quartz pyramid which sits at the centre of the board, a starter pack of different coloured Healing Request Cards and with a choice of crystal wand for charging the board. They also come with comprehensive instructions and guidance for setting up the board, including how to cleanse and charge the crystals, different uses for the board and a sample affirmation. Each board features six hand-picked, natural (unpolished) Clear Quartz crystals, which are fixed to the board and finished with silver-plated wire. Chakra stones:- Root: Hematite, Sacral: Carnelian, Solar Plexus: Tiger Eye, Heart: Rose Quartz, Throat: Blue Lace Agate and Third Eye: Amethyst. The Clear Quartz Pyramid, representing the Crown chakra, is placed at the centre of the board on a hexagonal mirror. The mirror acts to amplify the energy of the pyramid thus intensifying the power of your healing requests. Each board comes complete with a starter pack of 20 x Healing Request Cards - coloured postcards for you to write your affirmations or healing requests on. You will receive five cards of each colour: pink (for relationships), yellow (for mental clarity and balance - good for work projects), blue (for healing) and green (for financial matters). After writing your request or affirmation on one of the cards, place it face up on top of the mirror in the centre of the board, then position your Clear Quartz pyramid on top of the card. You have a choice of three different styles of Quality 1, Clear Quartz wands for your board: Traditional: polished with round bottom, Standing: polished with flat bottom or Double Terminated: polished with two points- see pictures below. This is an exclusive item you will not find anywhere else; designed and produced in the UK by Patinkas. Clear Quartz Wands - choose from . . . Included in the package: 1 x wooden Reiki / Energy Board (with 6 x wired crystals, 1 x mirror and chakra cabochons), 1 x Clear Quartz Wand, 1 x Clear Quartz Pyramid, Set of 20 x Healing Request Cards (5 of each colour) plus guide & instructions for use. These boards are handmade by healers and each is individually cleansed and blessed before being despatched to you. 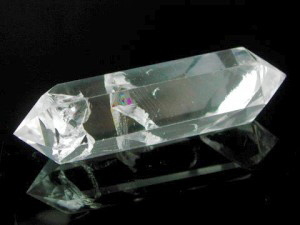 Due to the unique properties of crystals, each may differ slightly in appearance from the ones shown on this page, but all will be of equal quality. *Postage price shown above applies to UK Mainland deliveries only. For all other areas, including international delivery, please contact us for shipping costs. Other Exclusive Reiki Healing Crystals from Patinkas . 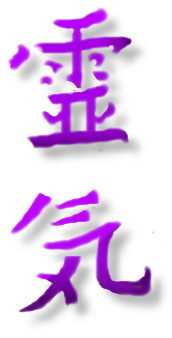 . .
Place cursor over image to see un-blurred Reiki Stones© image.